July 29, 2016 – Today we’re going to hear from popular historian and frequent TV news guest, Doris Kearns Goodwin. 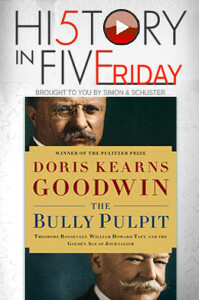 Her latest book is, The Bully Pulpit: Theodore Roosevelt, William Howard Taft, and the Golden Age of Journalism. She previously touched on the extended Roosevelt family twenty years ago, writing No Ordinary Time: Franklin and Eleanor Roosevelt: The Home Front During World War II , for which she was awarded the 1995 Pulitzer Prize for History. Remember to subscribe to the History Author Show on iTunes, like our iHeartRadio page, or make us appointment listening on your Android device, so you don’t miss an installment of History in Five Friday. It’s the perfect way to kick off your modern weekend… with people from the past.